I know the toy store and shopping online can be a bit overwhelming. So many options! My advice? Keep it simple. If you’re looking for some gift inspiration for your little one, here are my recommendations. These are classic toys that your child will use throughout their childhood. Play is closely related to language development, so it’s a big part of what pediatric speech-language pathologists do; encourage and support play! Most kids develop play skills with ease, but others may need more individualized support to learn to play. Kids are gaining so many significant skills through play, such as problem-solving, critical thinking, fine & gross motor skills, and communication skills. 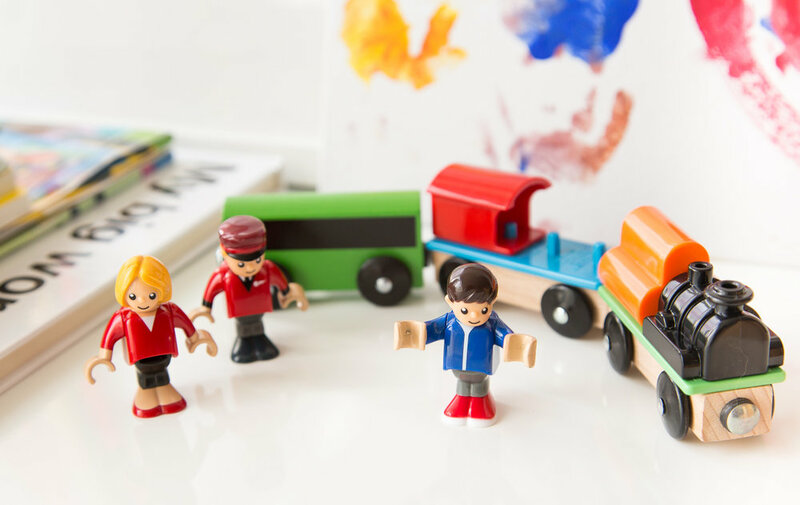 The guide is broken down by age, and toy recommendations are based on how children typically develop play with a focus on toys that promote language development. I haven't listed many brands, because I don't want that to be to focus. Kids definitely don’t need each item in all of these categories... the list is more meant to give you some ideas and then you can modify as you wish based on your child’s interests. Ready? Let's jump right in! For new babies, I recommend few high contrast toys to look at (the clutch toy above is by Haba), something interesting to touch, board books for starting a reading routine, a play mat, and you're good to go! Their favorite “toy” is YOU! Looking at your face and listening to you talk is building the foundation for learning to communicate from the day they are born. Pretty incredible, right?! At this age, I think it should be all about taking care of the mother. Yup, that’s right. Instead of spending money on toys for the baby, I would buy something extra for the mom like a gift card to her favorite coffee shop, a new top she feels great in, or spa treatments (yes, I’m serious!). Same goes for dads! Take care of each other. When parents are feeling good and cared for, they are more likely to have the mental and physical energy to be present and interact with baby in meaningful ways, which is so much more important than any toy you could buy. Finding ways to connect with other new moms is also really important when you have a new baby. Another great gift would be a gift card for participating in a baby music class, or workout class would be great. By participating in a music class, you will learn songs to sing throughout your child’s early years. So valuable! In Vancouver, I love Fit for Two for baby-friendly postnatal fitness classes, Chorus and Clouds for music classes (The owner, Jessica, also released a super sweet new CD that's on repeat in our house! ), and Signing Babies for baby sign language classes. The community centres have great options as well. Even if you’re not super social, meeting one or two other moms you can connect with is so valuable as you enter this new stage of life. A cute & useful teether is also a great gift for a baby. I love these Glitter and Spice teethers. A quality nursing/carseat cover would also be lovely. Also, these little adorable little beanies by LoveWicklow. All of these items are created by local mamas. At this age, babies are all about exploring their environment. They are starting to make so many connections about how the world works. Babies at this age also love simply exploring child-safe household items like mixing bowls and wooden spoons. You may be wondering how these items are helping your child learn to talk and communicate. By you TALKING about what what they are interested in (even if it's just a ball rolling across the floor), they are learning to understand the meaning of words and building a strong foundation for getting ready to speak. So, talk, talk, talk! Around age one, little ones start to play in more functional ways. They begin to understand that a toy item can be used in play to represent objects in the real world. This is an exciting time when you will begin to see their pretend play skills emerge and play skills will start to flourish. First, children will begin to pretend with themselves. For example, they will pretend to take a drink from a toy cup. Soon after, they will begin to do things with another object, like giving a baby doll something to eat. This probably goes without saying, but don’t get caught up in gender stereotypes when choosing toys. I recommend cars, trucks, and a baby doll to all my clients. Pretend play really starts to take off at this age and you will see their imagination come to life! Play becomes more complex and they will begin demonstrating multiple steps in their play. For example, they may give baby doll a bath, dry baby off, and put the baby down for a nap. You will also start to see them use a completely unrelated item to represent something else, like sitting on a pillow and calling it a car. Their interests will become more obvious and that will help guide your purchases. By this time many kids will be telling you EXACTLY what they want (if they haven't been already). In this age range, they are learning more about social communication and interacting with their peers. They are acquiring skills like problem-solving, critical thinking, and communicating effectively with others. They will play with many of the toys mentioned above with more advanced skills. For example, the pretend food they played with before to feed a stuffed toy, can now be used to play restaurant, grocery store, birthday party, coffee shop…. so many open-ended options! Hope that helps! Let me know if you have any questions in the comments. I would also love to hear about toys your child loves to play with or what gifts you plan to get this year. If you’re interested in knowing more about learning activities for your young child that support the development of language, play, and pre-literacy skills, sign up for my monthly newsletter full of tips, strategies, and activities for your little one. The print in the top photograph is by Banquet Workshop.